Help Us Build A Clinic At Daylight! We want to build a clinic at Daylight Center and School. Currently, the closest clinic is over an hour away on a good day—and that’s just to treat basic fevers and wounds. 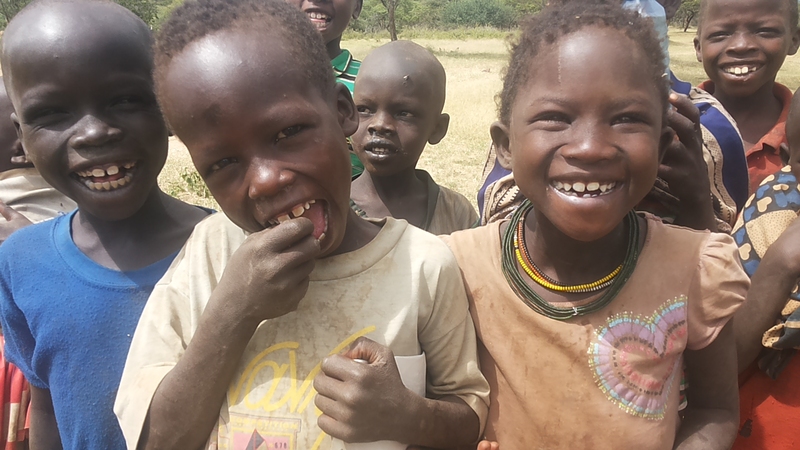 The kids at Daylight Center and the community around Kapenguria, Kenya deserve better. Contemporary artist Chris Larson and Michael Kimpur, a leader in rural Kenya, want to take the Breuer house—the house Chris burned down summer 2013 as part of an art festival—from St. Paul, Minnesota and send it across the ocean to Kapenguria where it’ll be a clinic for the kids at Daylight. What’s happening in western Kenya? What’s Daylight Center and School? There is a lot of tribal warfare in western Kenya. There has been for a long time. Stealing animals through force or “cattle rustling” is at the heart of the problem. Animals—goats and camels—are the nomadic peoples’ food and currency and from a young age, boys are taught to steal from rivaling tribes, armed with AK-47s. Many people are killed in the resulting violence. Many see no alternative. Daylight Center and School strives to empower the nomadic communities to realize a peaceful future for themselves. They believe that children are the key to breaking long-standing generational patterns of violent behavior. Daylight is located in the city of Kapenguria at the edge of the nomadic lands—it’s beyond the end of the main road out of Nairobi. Today, Daylight provides food and education for over 200 kids who come from over 16 tribes in the region. They hope to one day increase enrollment to over 600 children. Above is one of the dormitories recently built at Daylight Center. Michael grew up as a nomadic child soldier for the Pokot tribe. When a neighboring tribe attacked his village, stealing their cattle and killing hundreds of people in front of him, Michael and 20-30 other small boys disappeared into the desert. By the grace of God, they stumbled into a WorldVision feeding camp and Michael was enrolled as a sponsor child. Eventually, he would receive his BA from Daystar University in Nairobi and later, an M.A. in Organizational Leadership from Bethel. 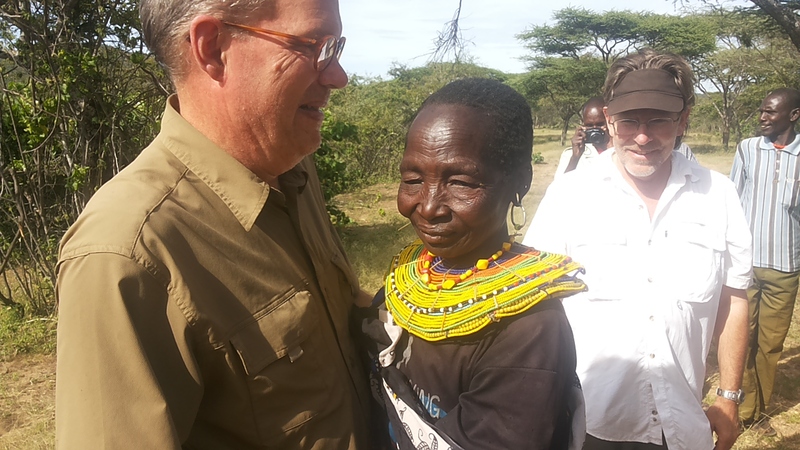 He founded Daylight Center and School in 2008 in response to the devastating violence he saw in the nomadic regions of Kenya. It was an unusual, brave move, as most people that return to Kenya with advanced degrees retreat to Nairobi, taking well-paying jobs. Michael felt that it was his duty to return to the nomadic people. You can hear his full story here. Chris Larson is an artist from St. Paul, Minnesota. He incorporates film, video, photography, performance and drawing/painting, often in installed environments. His work was included in the Whitney Museum of American Art’s 2014 Biennial. His work can be found in the permanent collections of the Staatliche Museen zu Berlin, the Kemper Museum of Contemporary Art, the Minneapolis Institute of Art, and is currently on view at the Walker Art Center. You said that Chris burned down the Breuer house before? Yep. Chris built a to-scale replica of Marcel Breuer’s St. Paul house in an art project called Celebration/Love/Loss and burned it down during Northern Spark 2013. It wasn’t out of anger—Chris loves the still standing Breuer house. Rather, burning the house down was a commemoration of the house’s fiftieth anniversary, a gesture of hope for tomorrow. Read the article and see the video from The New York Times. To be clear: we will not be burning down the Breuer house in Kenya. It will be a brick-and-mortar building that will last for generations. What’s the history of the Breuer house? Marcel Breuer (pictured above) was one of the world’s most popular modern architects during the end of the 20th century. He made profound contributions to architecture with projects that include one of the world most popular chairs, St. John’s University’s Master Plan, and the UNESCO Headquarters in Paris. You can see a slideshow of his other work in Dwell here. Breuer built the house in St. Paul for Frank Kacmarcik. Kacmarcik and Breuer, who designed only one other house in Minnesota (in Duluth), had struck up a friendship when Kacmarcik was on the committee that chose the Bauhaus-trained architect to design the St. John’s campus and church in the 1950s. The project was a hit, and the two became friends. Years later, when Kacmarcik bought land on a wooded bluff overlooking downtown St. Paul, Breuer agreed to design an 1,800-square-foot house for him, which is the house we want to turn into a clinic for the kids at Daylight Center and School. Read more about the Breuer house in St. Paul in the Star Tribune. This article is a few years old—it’s no longer on the market. Above is a picture of Michael and Chris with its current owner, Chad Bogdan. Will the Breuer house work in Kenya? Where is the money going? Who’s getting paid? All the labor and materials for the building will be locally sourced in Kapenguria. The Kenyan team has verified that all the materials (bricks, mortar, etc.) required for the project are available, and Daylight has connections to other local building contractors, as they’ve constructed dormitories and school building throughout 2013. Any money beyond $75,000 that’s raised by this campaign will be used to buy additional supplies and resources for the clinic. Missions Teams to Daylight – Interesting in Going to Daylight in July 2015? Daylight kids love it when people come to visit. The times when “Mzungus” (Swahili for white person) show up are sure to be exciting weeks! Full of sharing stories around cups of tea, singing songs, and playing games. Students learning about what school is like in America, and the Americans learning about what life is like for kids in Kenya. For the next two weeks a team of 18 people of all ages from First Presbyterian Church are going to smile, hug, serve and laugh with the children and staff of Daylight Kenya. 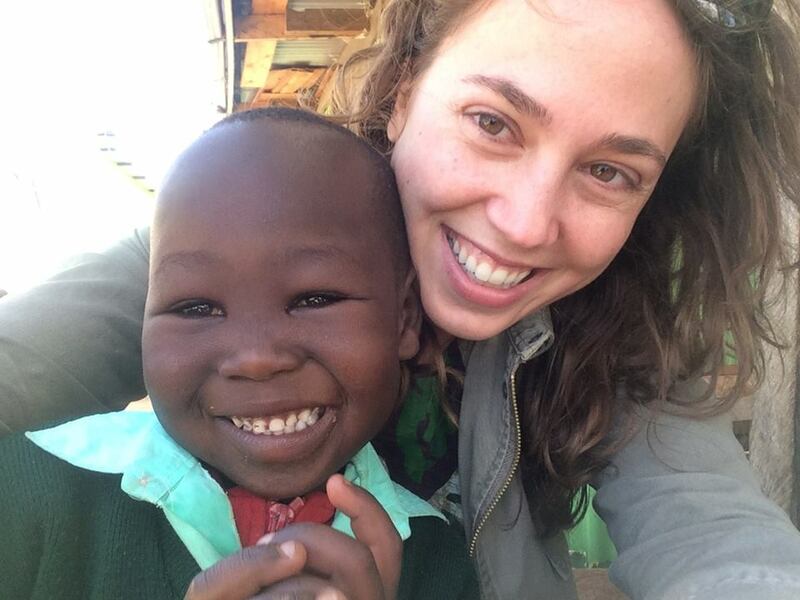 They will be installing in a new water reservoir system, teaching english, and handing out hugs (like Rachel wrapping up her old friend Joshua Kimpur). Keep them in your thoughts and prayers for the next two weeks as they serve in Kenya. Whether the visitors are coming to build a new classroom, teach English, or just add another friendly face on the soccer field, Daylight kids are excited! Excited to meet new people, practice their English (“HOW ARE YOU?” “I AM FINE!” is a popular first phrase), and say a big THANK YOU, JAMBO ASANTI SANA! Interesting in Going to Daylight JULY 2015? We have 3 spots open for our trip to Daylight Kenya on our team going July 10-24th. The cost of the trip is $3000/person and trip applications are due Feb 10th. This team is comprised of parents and teenagers from Minneapolis, MN who will run learning camps and classes in Kenya, and go on a day Safari. 3 spots are open to anyone who is willing and able to teach kids. If your wondering what a trip to Daylight entails take some time to read our travel manual. When a Pokot woman has her first born child, her name changes from her given name to Mama-(name of first born). So when I was born my mom’s name became Mama-Kimpur. And she was such a proud Mama this fall when I pulled into our small village with three American Doctors to have a clinic for the villagers. The village elders in Alalle (where the Daylight Outreach Nursery is located) had been asking for a long while for us to do a clinic and finally the week had come! This fall Doctors Lenny, Larry, and Joel made the long trip across the desert to do check-ups and treat our nursery school students, their families, and the community. They saw 300 people in 3 days. 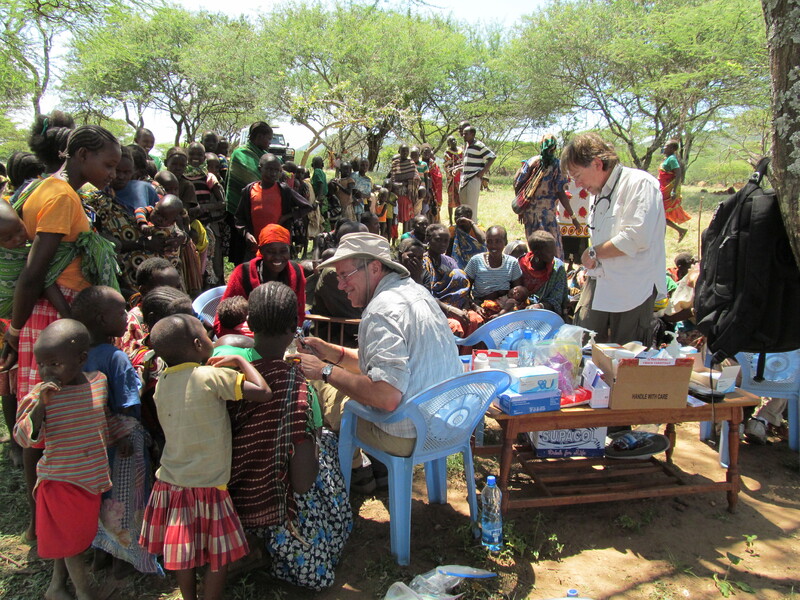 It was quite a flurry of activity and the people were so encouraged to get medicine for there pain and sicknesses. And my Mom was so proud as she walked around the clinic telling everyone that her son had brought Doctors from across the world. It was really a special day for me and Mama-Kimpur. Thanks to Larry, Lenny, and Joel and all of you for making this healing clinic possible and for making my Mom so proud of me!